Course Objective: This is an intensive course designed to handle the major issue of being a director for film or TV based productions. This is an intensive course designed to handle the major issue of being a director for film or TV based productions. The Academy's curriculum shall work with all the elements of the production and explore and practice how they support those relationships (the drama): the script (the words), the blocking (the stage directions), the costume, the set, the props, the sound track, the music, the make-up, the crew, and the camera & lighting. Eligibility: Minimum 10+2/Intermediate School pass. Candidates appearing/appeared in qualifying examinations may also apply. What is your job as a director? What is drama? How does it 'work'? Understanding talent. How to give an actor notes. Working with your AD/ production/designer/ producer/ script supervisor/DP /etc. Class room Teaching Medium: Medium of Instruction will be both Hindi & English. Examination Medium & Pattern: Students will have the option of giving exmination either in Hindi or English mediums. The assessment will be conducted in New Delhi followed by the award of Diploma by RKFMA. Note: The above mentioned syllabus & examination information are not exhaustive. Changes could be made in the syllabus & examination information by the Academy from time-to-time according to the demand of the industry. 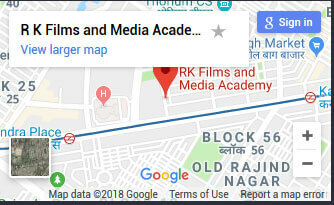 RKFMA suggests you to keep yourself updated regarding the same information by frequently contacting the Institute.. You may also speak with our admission counselors at 011-45064241, 9312237583, 9312231374 (New Delhi, India) to get admission information.